With a 100-54 won-lost record, the Montreal Royals finished the 1946 regular season in first place in the International League, 18½ games ahead of the second-place Syracuse Chiefs. The Royals were affiliated with the Brooklyn Dodgers and were managed by Clay Hopper. The most sensational player in the league was Jackie Robinson, the Royals second baseman. 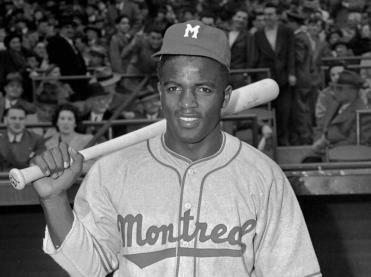 He broke the minor-league color barrier, drew record crowds, and led the league with a .349 batting average. After winning the first two games at home, the Royals won one of three games in Newark. The teams returned to Montreal for the sixth contest, a night game on Wednesday, September 18, 1946, with the Royals needing one more victory to win the best-of-seven series. The paid attendance at Delorimier Stadium was reported to be 19,322. The starting pitchers were right-handers Frank Laga2 for the Royals and Duane Pillette for the Bears. The game was scoreless through four innings; Laga allowed no hits while Pillette escaped jams in the second and fourth innings. But Newark rallied for four runs in the top of the fifth, the result of three singles (by Milt Byrnes, Blas Monaco, and Buddy Hassett), a double by Brown, a base on balls to Pillette, and an error by Robinson. With two outs in the inning, Laga was replaced by right-hander Chet Kehn. After Pillette walked Marv Rackley and Robinson to start the bottom of the fifth, he was replaced by southpaw Herb Karpel, who had led the International League with a 2.41 ERA during the regular season. Rackley scored on Lew Riggs’ single, and Robinson came home on Les Burge’s sacrifice fly, cutting Newark’s lead in half. In the seventh inning, Robinson ripped his second double of the game; Riggs’ single sent him to third, and he again scored on a sacrifice fly by Burge. Alex Mustaikis, Newark’s “ace fireman,”6 replaced Karpel on the mound. The next batter was Tommy Tatum, who lined a single into left field. Herman Franks followed with a double off the scoreboard, which was retrieved by Frank Colman, a strong-armed right fielder. In the seventh inning, Colman had impressively thrown Riggs out at the plate. Nonetheless, Royals manager Clay Hopper, coaching along the third-base line, sent the speedy Tatum home. Colman’s throw was on the money and in Berra’s mitt ahead of the runner, but Gore called Tatum safe. With that, the Royals won the game, 5-4, and the series, 4 games to 2. Berra flew into a rage and rushed at Gore, the benches cleared, and even “some of the crowd boiled down out of the stand to take part in the melee. Then came the police and Umpire Gore was escorted off the scene and the riot subsided.”7 Gore said afterwards that Berra had missed the tag. With the Bears’ season over, the Yankees called up Brown and Berra. They made their joint major-league debuts four days later in the first game of a doubleheader on September 22. In addition to the sources cited in the Notes, the author used the Baseball-Reference.com and Retrosheet.org websites. 1 Yogi Berra and Dave Kaplan, Ten Rings: My Championship Seasons (New York: William Morrow, 2003), 14. 2 Laga, 26, had been recently recalled from Mobile of the Class-AA Southern Association. He started in place of left-hander Steve Nagy, out with arm trouble. Dink Carroll, “Umpire Artie Gore Is Victim As Bears Beaten 5-4,” Gazette (Montreal, Quebec), September 19, 1946: 16. 3 Karpel had appeared in two games with the Yankees in April 1946 before being demoted to Newark. 4 Dink Carroll, “Playing the Field,” Gazette, December 30, 1946: 12. 5 Carroll, Gazette, September 19, 1946: 16. 6 “Mustaikis Ace Fireman for Newark,” Elmira (New York) Star-Gazette, August 9, 1946: 10. 7 Carroll, Gazette, September 19, 1946. 8 Edgar C. Brands, “No. 1 Men of 1946,” The Sporting News, January 1, 1947: 1. 9 Gore was the third-base umpire in a three-man crew. 10 Berra and Kaplan, Ten Rings, 14.